CPWplus models are constructed with a durable stainless steel base that is both sturdy and easy-to-clean. CPWplus is suited to many types of weighing applications in the field, warehouse or lab, such as food processing, shipping and receiving, materials testing or veterinary use. 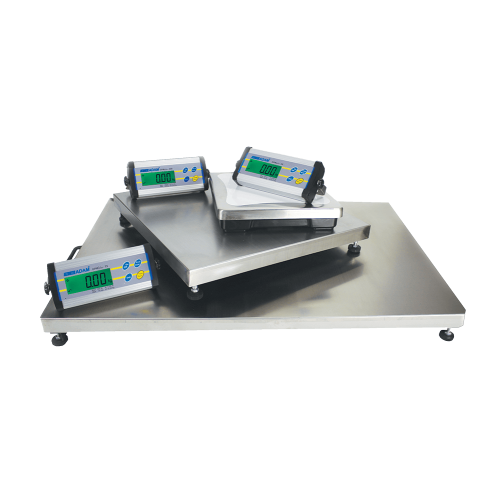 The CPWplus comes complete with a display hold feature that can precisely capture the weight of an animal that has been placed on the scale platform. Larger CPWplus floor scale models are often combined with a non-slip rubber mat for weighing larger pets such as dogs in kennels, groomers and veterinary offices. The CPWplus makes for an effective parcel scale and can be used to weigh bundles of letters, packages and other post in postal offices prior to distribution. Warehouses that store stock and require delivery cost estimates can use the CPWplus to calculate a weight prior to posting to ensure customers are charged the correct delivery amount. The CPWplus floor scale has a display hold feature that allows the scale to capture the weight of a person standing on the scale. Boxing clubs and other sports that use weight classes for competitions often use this feature to record an accurate weight of competitors to ensure they are within the optimum weight limits for their weight class. The simplicity of the CPWplus makes it highly adaptable for use. In food packing and processing facilities, food products can be accurately weighed prior to packing. The stainless steel top pan means that the scale can be easily washed down after use in order to maintain food health and hygiene standards.